Looking for a good recipe to use with the gulf shrimp that are now back on the market? 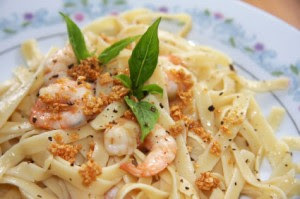 Try this recipe for Shrimp and Crawfish Fettuccine, originally posted on Tony Chachere's blog on Mouth Watering Monday! This version is different from the one my mom always makes. The addition of the spicy Jalapeno relish really spices things up. In a Dutch oven, saute’ onions, celery, bell pepper, and green onions in oil on medium heat until tender. Add flour, parsley, and crawfish and cook for 15 minutes. Add relish, cheese, Half and Half, and garlic. Stir often to prevent sticking. Season with Tony Chachere’s Original Creole Seasoning. During the last 10 minutes of cooking crawfish, begin boiling the pasta so that it will be tender at the same time that the crawfish is cooked. Follow directions on the bag to boil the pasta. When the pasta is tender, drain, rinse in cold water, and drain again. In 1 or 2 casseroles, coated with cooking spray, pour some of the pasta across evenly, then cover with crawfish mixture. Continue alternating pasta and crawfish mixture until all is used up. Sprinkle top wit Parmesan cheese (optional) . We love Tony Chachere's and all your yummy recipes! Thank you for sharing them with us! Jambalaya, a Louisiana specialty ! Share your creations and party ideas with us!